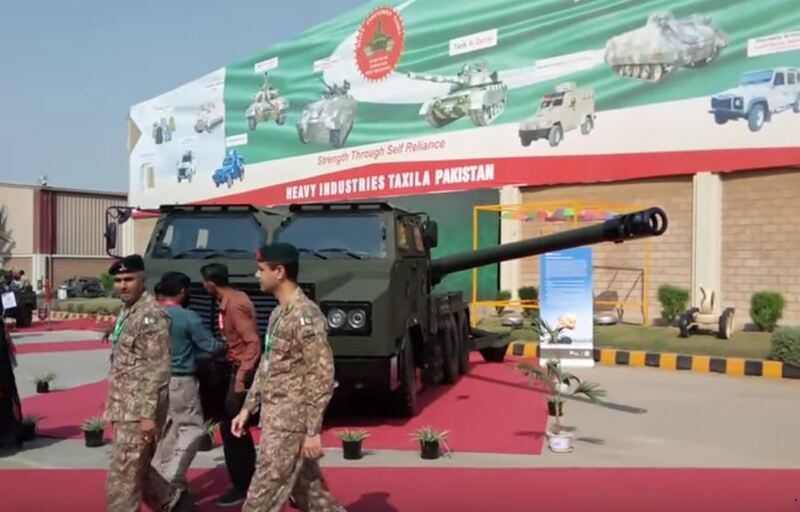 During the recent IDEAS 2018 arms show in Karachi the state-owned manufacturer Heavy Industries Taxila (HIT) displayed its entire product catalog. A genuine surprise was the appearance of an unnamed 6×6 truck mounting a large caliber artillery piece. 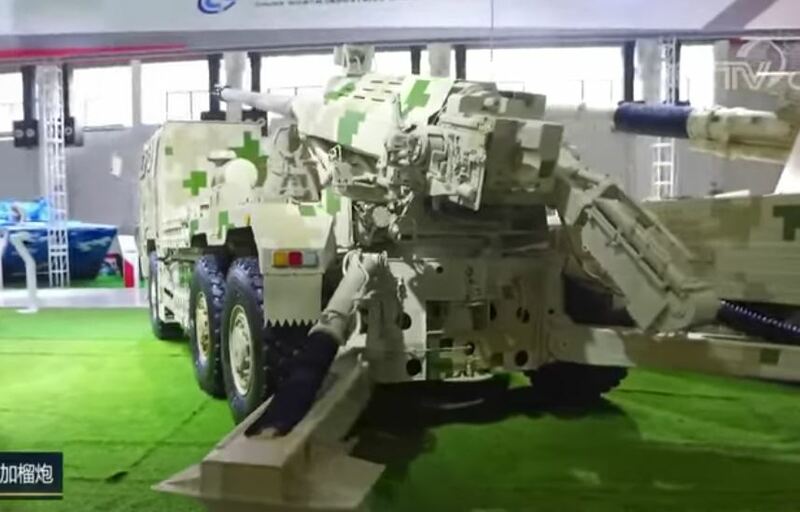 Upon closer inspection the vehicle was identified as the “SH15,” a new truck howitzer model from China’s Norinco that was also put on display at this year’s Zhuhai Air Show in Guangdong. The SH15 is the world’s newest self-propelled artillery piece and seems to have found a predictable customer–China’s favorite client state. Although truck howitzers–often large trailers modified to support an artillery piece–have become fashionable in the global arms industry, militaries all over the world haven’t embraced the trend yet. Indeed, some of the largest ground forces in Asia–India, Iran, North/South Korea, Russia, and Turkey–aren’t keen on adopting truck howitzers. 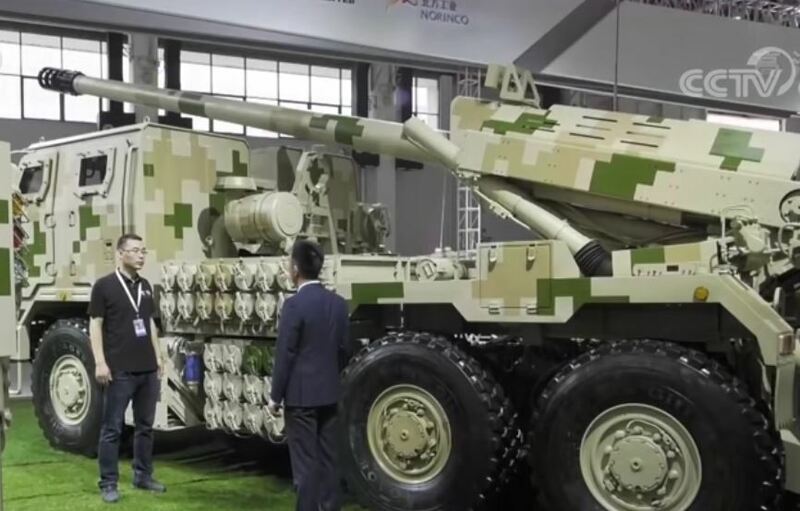 Even China’s PLA maintain a huge inventory of older towed howitzers, mostly 122mm and 152mm models copied from Soviet designs, and a rare truck howitzer called the PCL-09 is limited to units in the south and southwest. 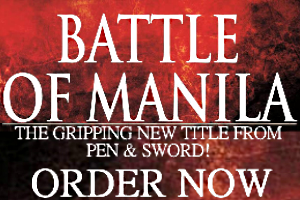 The SH15, however, is the latest iteration of the SH-series self-propelled artillery catalog meant for export. Its original variant the SH1 enjoyed modest success with deliveries to Myanmar. The SH15, by comparison, features a number of improvements while retaining a 52 caliber 155mm gun able to hit targets as far as 50 kilometers away with specialized ammunition. The SH15 at an indoor display during the Zhuhai Air Show. Via Chinese state media. The SH15 is based on a 6×6 chassis for a flatbed truck and is broadly similar to the Israeli ATMOS 2000 and the South African Denel T5. The armored cab offers seating for the gun crew, who number a mere handful, and operating the 155mm howitzer is done by remote control. To stabilize the gun before firing, for example, two hydraulic spaces that work like split trails on a towed howitzer form a “V” shape on the ground for cushioning the gun’s immense recoil. Each round and its propellant are loaded manually and the rate of fire per-minute is no different from a towed howitzer’s. A novel feature of the SH15 is its magazine arranged in an open compartment behind the cab with individual rounds stored in airtight cylindrical tubes. How soon the SH15 enters service with Pakistan’s army is unclear. But for HIT to display a foreign vehicle means it has acquired the expertise for local production. A new 155mm self-propelled howitzer will go a long way in rehabilitating the army’s atrophied artillery arsenal. To date, aging US-made howitzers offer few advantages versus the Indian army’s upcoming generation of artillery pieces. The Pakistan army’s collection includes 315 155mm M109 self-propelled howitzers; 88 203mm self-propelled and towed howitzers; 322 155mm towed howitzers; 216 105mm towed howitzers. Nearly a thousand 130mm and 122mm towed howitzers acquired from China are becoming antiquated as well. But the SH15 may only see limited service with Pakistan’s army given its constant budget woes. At best, these truck mounted 155mm howitzers should complement the proven M109/A5’s and are easier to maintain and transport. When it comes to extreme range and sheer firepower in conventional war, the PHL-03 multiple rocket launcher is a better investment than amassing multitudes of guns. Still, HIT’s privileges with Chinese weapons technology shows the depth of the Beijing-Islamabad alliance.